EAS change systems introduces a new tool to configure mold change tables, giving a direct and realistic insight of the implications of the chosen solution. This Configurator 360 will be presented at the Fakuma 2018 exhibition, together with several clamping solutions – hydraulic as well as magnetic, mold change carts and multicoupler solutions. EAS’ exhibits can be found at booth 7203 in hall A7 at the exhibition in Friedrichshafen. The mold car EAS demonstrates at their booth – A7-7203 – offers easy loading of a tool. The loading height of the mold cart is adjusted effortlessly and docked onto the machine, after which the tool can be (un)loaded effortlessly in or out the machine. It provides a rapid and efficient way of converting a manufacturing process from running the current product to running the next product. EAS also offers hydraulic and magnetic clamping solutions of which they will demonstrate different examples at the Fakuma. Depending on the size of the machine, the level of automation of the system and the weight of the tool, the best solution can be chosen. The demonstration units give an overview of the key features of the possible solutions. The special floating design EAS uses for all its customized multicouplers is also demonstrated at the stand. Different couplers can be combined to form a multi coupler solution. Because of well thought out and innovative design you can combine water, air, hydraulics and electrical connections into one automatic multi coupler. The multi couplers offer simple and leak-proof connections of fluids and electricity. There are manual and automatic coupler systems available, both offering secure and user-friendly operation and a quicker change over. 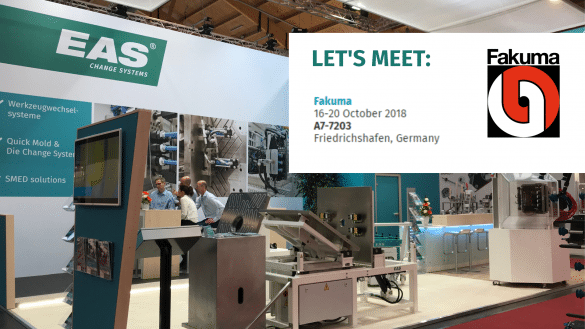 For more information, visit http://www.easchangesystems.com or stop by stand # A7-7203 at the Fakuma from 16-20 October 2018 in Friedrichshafen, Germany.